Panasonic has announced the latest addition to its G-series range of cameras – the Panasonic GH2. 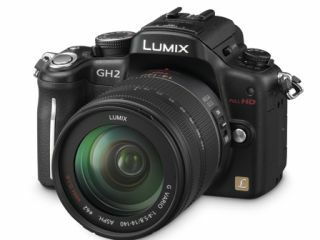 A successor to the GH1, the GH2 has been given a slightly smaller chassis and touch-control shooting. The sensor on the camera has been improved, offering 16.1MP Live MOS, up 4MP from the GH1, and ISO capabilities have also been substantially increased. While the GH1 brought an ISO range of 100-3,200, the GH2 manages a whopping 160-12,800 ISO, which is the equivalent of a human eating a billion carrots and being able to see in the dark. Kind of. Panasonic has decided to act seriously when it comes to video shooting on its G series. It may have given both the GH1 and G2 HD video capabilities (720p and 1080i respectively) the GH2 has the added bonus to shoot 1080i at 24fps, which will make your movies much more cinema like and bump up the quality. Unfortunately bitrate is still hampered by AVCHD but it is a significant improvement. Other updates include 5fps continuous shooting and the addition of a new noise algorithm. It's the kind of technology you wish they would create for children; the Venus Engine FHD brings optimal noise reduction so you can shoot on the stupidly high ISOs without the fear that noise will ruin the image. Panasonic has also introduced the 'world's fastest' light speed autofocus, which will take a mere 0.1 seconds to capture an image. Add to the mix touch control, which even allows you to release the shutter from the LCD, and what you have is a very smart camera. Panasonic has also announced the arrival of a new 3D lens, which will turn your Lumix GH2 into a three-dimensional wunderkind. The Lumix G 12.5mm / F12 (H-FT012) has two optical systems installed within the diameter of the lens mount, creating stereo images from the left and right lenses. And it is compact, too. The lens apparently shoots 3D images "without distortion or time lag between left and right images, even for moving objects." The Panasonic Lumix DMC-GH2 has a UK release date of December with pricing to be announced.